I recently read an interesting patent which describes a capacitor driven water droplet launcher. U.S. Patent 6,220,141 "Liquid Projectile Launcher" claims that this device can deliver a water droplet at high speed (1000 m/s, ~Mach 3) at "short to medium range". The authors also suggest various additives to the water to produce desired effects on the target. These include humanitarian substances, such as vaccines or antibiotics, as well as more nefarious materials such as acids, bases or solvents to generate a pain response (having at one time or another spilled all of these things into open cuts, I can testify that they do indeed sting), capsaicin (hot pepper oil) for more serious pain, or histamine (do not pass go, do not collect $200, go directly to anaphylactic shock). For more ideas along these lines, see my chemophobia page. 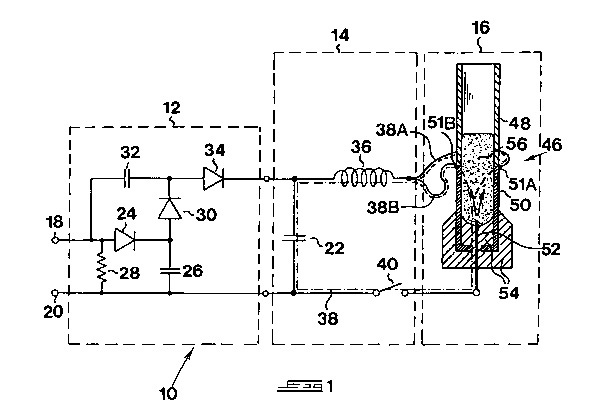 The principle claim of this patent is that the use of multiple conductors (or better, a coaxial arrangement) to feed power to the drive portion of the barrel results in a more spatially coherent liquid projectile with a longer effective range. I have a couple of problems with this patent. First, the range specification was very unclear. It seems unlikely to me that a water droplet would be aerodynamic enough to maintain coherence over a distance of more than an inch or two. I wanted to test this. Second, the design presented in the patent is clearly a single shot device. The capacitor is charged from a built in voltage multiplier powered by mains supply. The described trigger is a simple switch with two metal strips which are designed to fuse together on operation. Although the patent calls for the inclusion of a sliding device to pry apart the contacts after use, a second shot would require plugging it in to recharge the capacitor and refilling the breech with liquid using a syringe type dispenser. This is the schematic of the water gun, taken directly from the patent. The section within the dashed box twelve is a voltage multiplier for charging the main capacitor, 22, from 220 VAC mains (the patent is assigned to a British company, Injectiles Ltd.). The gun itself is depicted within the dashed box 16, with the muzzle pointed up. The patent claims that the liquid projectile, 56, preferably has a maximum mass of 0.1 grams. The barrel consists of a muzzle end, 48, which should be non-conductive, between 2 and 3.5 mm in internal diameter and 20 to 50 mm in length and a breech end, 50, which should be conductive and the same diameter as the muzzle end. An electrically conductive pin, 52, serves as the second electrode in contact with the projectile. The patent suggests that capacitor 22 has a value of 150 mF and is charged to 1000 volts, giving a stored energy of 75 joules. The inductance, 36, totals ~0.5mH, giving a discharge frequency of 18 KHz. Upon closure of switch 40, the patent claims that a portion of the projectile is converted into a 3000-6000 ºC plasma which is accelerated down the conductive portion of the barrel, like the plasma armature of a rail gun, pushing the remaining portion of the liquid projectile in front of it.